Flip a coin. If heads, the Defending Pokemon is now Paralyzed. If tails, the Defending Pokemon looses 30 HP plus reagular damage for this attack. Pichu & Pikachu loose 30 HP. Comments : Pichu evolves into Pikachu. 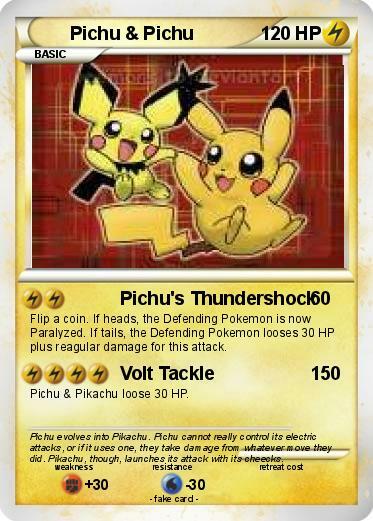 Pichu cannot really control its electric attacks, or if it uses one, they take damage from whatever move they did. Pikachu, though, launches its attack with its cheecks.